Why did they make the front-brain-amputating Krakatau Aqua Coaster, and why did I become addicted to it? I rode on it three times, like a man searching for the forgotten cities of gold in the fever-jungles of Central America. Back I went, again and again, thrown down horrifying dips that nature did not design us for. Every time I believed I could master it. But panic overwhelmed my brutish primate lust for control, and so I shrieked-laughed most of the way. The Krakatau is both water-ride and roller-coaster, a hybrid beast not seen outside of the fantasies of Dr. Moreau. For centuries, such unions were denounced as unholy, impossible—an affront to a rational God. But Volcano Bay has done it. The raft you ride for Krakatau is rigid, almost Calvinist. This ridiculous bullet is sent down a slick plastic tube at velocities in excess of twelve billion meths a second. The first drop is a U-shaped event, and thoughts of death are common. The animal inside you knows this is it, you have seen the last of the sun. But oh no; there is more in store for you. Universal Orlando just opened a new water park, Volcano Bay, on thirty acres of what used to be Florida. They asked if Paste wanted to go. I volunteered as tribute. Krakatau Aqua Coaster is their big ride. I went on it after a day of being escorted around the Universal Pictures Theme Park. I felt like a medieval cardinal. Can I ever go back to living my normal existence, after being feted, fed multitudes of meat and grains, and being allowed to cut ahead on major rides? Can I, who have been treated like Mayor of Diagon Alley, descend into the hoi polloi again? Hell no, I can’t. This entire review is really my way of sticking it to my former life, famous home of paying for things. What makes Krakatau so unique—what Universal did—was that they cracked the divide between roller coaster and water ride. Roller coasters require a series of up-and-down sine waves. This is easy to achieve with iron vessels and pulley system lugging the carts up high. By contrast, water-raft rides normally force the visitor to ascend wooden stairs. When the time comes, the visitor must go down the tube. You are descending, period—there is no upward motion. The designer can disguise the phenomenon of mitigated falling in several ways: loops, whorls, spirals, et cetera. Yet however they dress it up, the ride is still stuck with the ever-downward motion—the principles of Newtonian gravity, nothing else. So it was. But Krakatau has gone beyond nature’s law: a water ride where you are pulled up as well as down. The bullet-raft has cavities at its bottom which the inhuman Krakatau’s wheels can grasp, and so when you hit the bottom of the drop, the raft is yanked back up at a speed faster than the velocity you just dropped. Quick as a tweet, you are lifted to a new peak … all while listening to a mixtape of music made of your own screams. The Bay had other innovations in store for us. Although the Volcano Bay water park has not solved the riddle of having to trudge upstairs, you are no longer required to drag a raft up with you: the ride has a conveyor belt which takes your rude vessel to the top. Not since the invention of the unicycle have basic principles of wheels been put to such impressive use. No wonder the Today Show had brought all thirty trillion of its reporters to cover the spectacle. I experienced each of these rides with my new press corps friends, M and C. C, who is eighteen and from Cornell, noted “You laughed hysterically.” I could not denounce him; this much was true—my public demeanor was villain-ish, unbalanced. 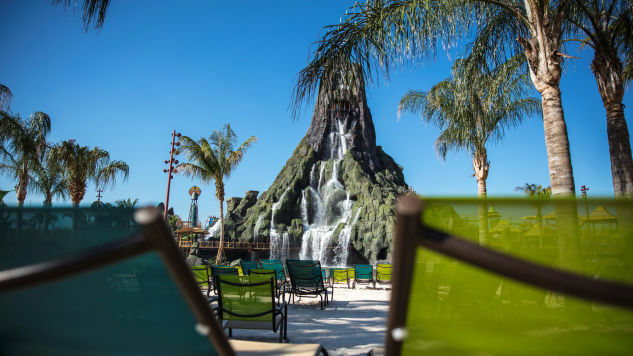 Volcano Bay massages your emotions, and Universal and its parent company Comcast will carve billions of dollars out of the national GDP with the Bay. The people who love theme parks do so for varied reasons. Some of us dream of returning to the amphibian world of our ancestors, so the seventy-five percent of the world which is not under our direct control can be settled and gentrified. Others simply want to stare in the watery face of King Neptune and whisper “Drown me today, if you dare.” Who truly knows why we frolic in the waves? My friend M, an Orlando local, informed me that this area is the last front in the park wars between Disney and Universal. The park itself is fabulous beyond the Arabian Nights: It is dominated by Krakatau Volcano, a hulking concrete mountain made of steel and ambition stretching up roughly two hundred feet—the highest point a structure can reach without the owner having to affix a blinking red light to it. The key to the volcano presentation is the park’s liberal use of pre-fab lichen sprayed all over the rocks, which gives it the appearance of an ancient Hawaiian peak recently attacked by water slides. Pipes run out of the mock-mountain, IV tubes ministering nutrients to a giant. These tubes, it turns out, were rides. I went down one of those cylinders, the Ko’okiri Body Plunge. It was a high-speed crazy-making experience. I was informed that there would be no raft in these tubes; I would be the raft; I was born to be the raft. After a climb upwards, we were offered three flavors of tube. The outrageous red, a straight drop down the mountain; the mild blue; or the middle-of-the-road green, which would merely take a year off your life. I chose the green. The operators grew excited, and I knew I was crawling into the maw of oblivion. The woman operating the control panel told me to get in the chamber, cross my arms, and then my ankles. The effect is unnerving: consider being shoved into a laboratory chamber in Frankenstein’s Lab or Area 51, both of which are very real to me now. The tube doors closed with a polite hiss. Light, filtered green by the plastic around me, filled my vision. A constant jet of water went down my back. Somewhere else, the world went on, people making reasonable choices, informed decisions. Not me. Hell no: I had elected to be shot down a giant hill. I couldn’t hear the operator, but I could see her fingers counting down. Three. Two. One. Then the half-circle platform below me folded down, and the pull of earth did its thing. I am writing this all after the fact, and make it sound as if these were discrete, cut-and-dry steps. At the time, experience unfolded with the rapid illogic of dream speech. One moment, I was atop an artificial volcano, and then a half-second later, I was conscious of my nose filling with water. I was moving at unstoppable speed, Val Kilmer going down Bruce Wayne’s mystery tube in Batman Forever. Unlike my roller coaster ride, there was no screaming here, just a powerful desire to not freak out and gibber prayers to strange, forgotten gods. After a good sixteen hours of this, I was dumped into the pool at the bottom, bewildered, confused; the effect was uncannily like being born. Around Volcano Bay’s mountain is a series of mega-beaches, which have the purest sand of anywhere outside of Grand Cayman. Keep in mind that despite the two hundred or so press people involved, the park is so large that the three of us walked around the place for several hours without running into our fellow journalists. The park was not deserted—the compulsively friendly staff were never out of sight, and there were always press folk somewhere in eyesight—but no crowds assembled. We had the whole expanse of creation to ourselves: the wave pools, which we swam; the eerily perfect beaches, which we walked; the private cabanas, which we could not afford in normal times. With free drinks, food, and entertainment, and little restraint on our activities, we were Adam in a carefully-constructed Eden. It was hard to not feel like a lord of creation. Volcano Bay, like Disney World, takes the rough edges off. If you perambulate around the entire park, it is hard to tell exactly where you are, so easily does one part of the park yield to another. It was a highly-effective seduction, and we did not mind it. The day before, I had gone up with C to see a Mad-Men-style room in Universal’s Cabana Bay hotel. We admired the postwar color-scheme and dedication to the era of martini bingeing, but what drew everyone’s attention was the room’s mile-wide window, which afforded a view of Volcano Bay. I commented that this reminded me of the first half of Jurassic Park. Now that I was here, among immensely tall palm trees and soft ambient musics, I had to conclude I was wrong in my assessment. There were no dinosaurs here, nor were likely to be. A perpetual state of hazy peace swallowed me. All concerns of the outer world faded away. The Bay is designed along Polynesian lines, and its illusion is complete: I believed I was in another culture, another place. I have lived most of my life in flat plains country, and am usually ready to denounce the sea as a hideous, unpredictable alien medium which swallows ocean liners and houses murderous white whales. But after an hour in the shadow of Krakatau Volcano and on Waturi Beach, I was ready to forswear my rakish mainland lifestyle forever, and burn every shirt I had ever owned. Volcano Bay is the best water park on Earth, a planet whose surface is mostly liquid—a tough conference to be champ of. Half of the business of life is learning to be where you are, not wishing for somewhere you aren’t. If you’re constantly reminded you’re on vacation, it defeats the purpose of travel—your mind has stayed on the farm even if your body has journeyed far. Volcano Bay has mastered this game. When I was at the Bay, there was nowhere else in the world. We must get away to feel at home, and that’s the point of travel.